For a very long time I wasn’t drawn to the books of Susanna Kearsley. I read a good few positive reports, but I suspected that she would be one of those authors who did what she did very well without being the author for me. I had to find a copy. The opening chapter captured me. The emotions of Eva, mourning the loss of her sister Catherine, were captured perfectly. I cared, and I wanted to follow her story. That continued throughout the story. The storytelling was plain, but very, very effective. Every character, every situation, every emotion rang true. She was travelling from Californian home to Cornwall. To scatter her sister’s ashes where they had always been happy, where they felt they belonged, where they had spent many happy summers with family friends. Cornwall is captured perfectly, by an author who so clearly understands its heart and soul. Eva;returned to Trelowarth, the home of the Hallett family. Old friends, who understand her loss, her pain, and offer her love, support, and a place to come to terms with what has happened. And she can give them something too. As a PR consultant she can help them with their plans to encourage more visitors to come to the house, and to spend the money needed to keep it going. Eva begins to research the history of the house, and soon she finds the past reaching out to her. First she hears voices. And then she steps back into the past. To 1715, when Trelowarth was the home of Jacobites, planning to overthrow the protestant King George I and put a catholic claimant, James Stuart, on the throne in his stead. This is where I worried that things would go wrong. Time slip novels often do, but this one didn’t. I can’t quite explain why. But I’m sure it helped that of those concerned dealt with what was happening wonderfully pragmatically, and so the story could continue apace. 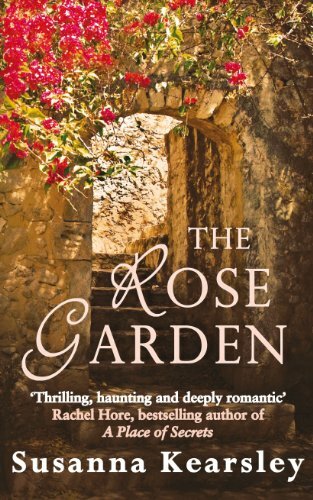 As Eva moves between past and present – tea rooms and rose gardens in the present; smuggling and rebellions in the past – she becomes involved with the lives of all those she knows at Trelowarth. The stories – both past and present – were engaging, with just the right details picked out. And there was always something happening, so I never stopped to wonder how this could all end. Eva doesn’t know where she belongs, until a wonderful twist in the tale – surprising but exactly right – resolves things beautifully. And then I realised that I had read a good old-fashioned page turner. A story of love, loss, adventure, tragedy, romance … what more could you want?! “Love, loss, adventure, tragedy, romance” … this sounds delightful. I have it in my stack of books to read and am really looking forward to it after your review! How strange – when I first started reading your review I was convinced it wouldn’t be a book for me too. By the end I was champing at the bit. I have this book on my shelves to read. Glad you liked it. I like Cornwall, remember visiting it years ago and have read several novels in that setting. I have ummed and ahhd about this book, but I did not realise it sounded as good as this. Will be one to look out for. Thanks for the recommend, the review was good. Currently on my pile of books from the library. Will have to move it up a bit!! Many thanks for the review. I read this a few months ago and I loved it too. I agree that the time slip element of the story was handled very well. My mam sent me a copy of this book, I wasn’t sure at first if it looked a little girly but like you I’ve also heard really positive things about it. After you review I think I’ll have to dig out my copy and start reading it soon. I’ve been intrigued by all the praise I’ve heard for this, but still a little scared off by the time slip aspect. Sounds like I should put aside my concerns and just try it! I’ve wanted to read this since I saw Helen’s review and a copy just became available at my library. Now if I can only find the time to read it…. It sounds marvelous! I loved this when i read it a few months ago but I’ve loved all SK’s books so didn’t need convincing! I’m glad you enjoyed it too.